Choose Your Own Adventure Books for Adults! What is a Click Your Poison book? Gamebooks, Interactive Fiction, Branching Path Stories, Text-based Adventures, Choose Your Own... Whatever you call it, I write tales in many different genres with many, many endings. And you, Dear Reader, determine how these novels unfold. 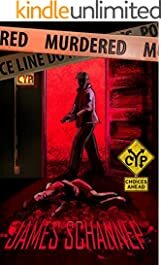 Darker, longer, and more complex than the old children's paperbacks, Click Your Poison books are the future of decision-based reading. Simply click the hyperlinked choice, and the story unfolds before you, different each time. No. All the Click Your Poison titles have a shared multiverse, but there's no need to read them chronologically. Just pick the one that interests you most and jump right in! INFECTED -- Will YOU Survive the Zombie Apocalypse? MURDERED -- Can YOU Solve the Mystery? SUPERPOWERED -- Will YOU be a Hero or a Villain? 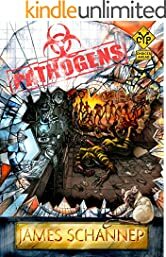 PATHOGENS -- More Zombocalypse Survival Stories! 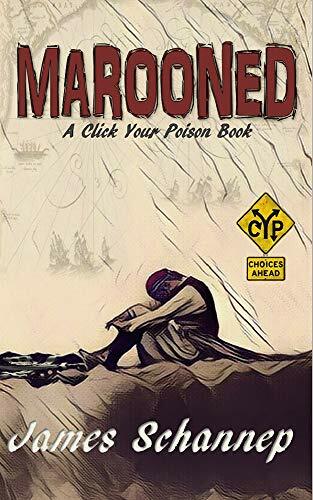 MAROONED -- Will YOU Endure Treachery and Survival on the High Seas? SPIED (coming in 2019)--Can YOU Save the World as a Secret Agent? INFECTED: Will YOU Survive the Zombie Apocalypse? (Click Your Poison Book 1) FREE FOR A LIMITED TIME! 3 Unique Storylines. Over 50 Possible Endings. Just one question... Will YOU Survive the Zombie Apocalypse? Everyone has their plan; what they'd do to survive if and when the zombies come. Now you can see how you'd hold up against the legions of undead--without needing to call the CDC because crazed bath salts users are trying to eat your face off. Here's how it works: You, Dear Reader, are the main character of this story. Live, die, and rise again based solely on the merit of your own choices. Each link represents a choice, and there's no going back, so choose wisely. "Infected. Is. So. Good." -- A girl just like you. "Holy $#*% this is awesome!" -- A guy more or less like you. Fans of The Walking Dead or George Romero's Living Dead series can now live their own apocalyptic adventure. Like the gamebooks popular in the 1980s-90s (Choose Your Own Adventure, Give Yourself Goosebumps, etc), this is a series where you choose how to progress through the book. 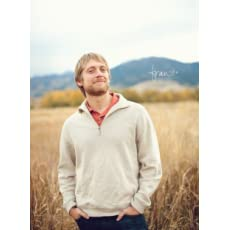 Unlike any others, this is the first series designed specifically for adults. And as an ebook, you simply click your choice and the story flows forward for you. No flipping pages. MURDERED: Can YOU Solve the Mystery? (Click Your Poison Book 2) .99c for a limited time! 3 Unique Storylines. Over 50 Possible Endings. Just one question...Could YOU Solve the Mystery? SUPERPOWERED: Are YOU a Superhero or Supervillain? (Click Your Poison Book 3) .99c for a limited time! 3 Unique Storylines. Over 50 Possible Endings. Just one question... Will YOU Be a Hero or a Villain? You know the superhero fantasy. What would life be like if you had superhuman abilities? But really, given the choice, would you save the world or conquer it? In SUPERPOWERED, the choice is yours. After a bizarre experiment leaves you with one of three superpowers (play the book multiple times to explore all three! ), you must ally with or confront the other two test subjects while the fate of Mercury City--nay, the world!--hangs in the balance. 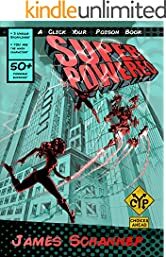 Live your own interactive comic book adventure and Get SUPERPOWERED! PATHOGENS: Who Will Survive the Zombie Apocalypse? (Click Your Poison Book 4) .99c for a limited time! Soldier, High Schooler, Martial Arts Instructor, Convict, Bank Teller, Mechanic. What do these six people have in common? When you step into their shoes, they're going to survive the zombie apocalypse. Pick from six characters and play 100 possible endings in this choose your own path style adventure. A spinoff of the bestselling Click Your Poison book, INFECTED, PATHOGENS is the ultimate Zombie Apocalypse gamebook! At the end of each chapter, click your choice and the story automatically evolves around your decisions. Zombocalypse, you say? That's right. Science has finally cracked the code on eternal life with the wonderdrug Gligazyme ®, but that advance came with a terrible price--the immortal living dead are coming to feed on human flesh. And that's not all you'll have to contend with... As civilization's fire goes out, the darkness creeps back in. Who will survive the zombie apocalypse? YOU decide in PATHOGENS! MAROONED: Will YOU Endure Treachery and Survival on the High Seas? (Click Your Poison) .99c for a limited time! 3 Unique Storylines. Over 50 Possible Endings. Just one question... Will YOU Endure Treachery and Survival on the High Seas? "More thrilling than fifteen men on a dead man's chest--more fun than a bottle of rum!" "If I could only bring one book to a desert island, that book would be MAROONED." "I wish I'd thought to make mine interactive..."
Here's how it works: You, Dear Reader, are the main character of this story, a youth born to prosperity in the English countryside. Now it's up to you to sail atop the vast oceans or be swallowed into their murky depths. Each link represents a choice, and there's no going back, so choose wisely. Whether you're a fan of classic seafaring book series like Horatio Hornblower and Aubrey/Maturin, or more modern films and shows like Pirates of the Caribbean or Black Sails, you can now live your own high seas adventure! Like the gamebooks popular in the 1980s-90s (Choose Your Own Adventure, Give Yourself Goosebumps, etc), this is a series where you choose how to progress through the book. Unlike any others, this is the first novel-length interactive book series for adults. And as an ebook, you simply click your choice and the story flows forward for you. No flipping pages.